Meet Frank and his new t-shirt! Several weeks back Dana and I found ourselves in Hot Springs, NC where we had the great privilege of meeting and befriending Frank, his lovely wife Debbie, his crazy Jack Russell Rosie and their Airstream Diva. The four of them are about to embark on the adventure of a lifetime across America. 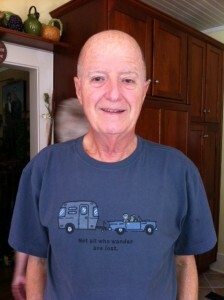 Frank just sent me this awesome pic of his new t-shirt. You can probably surmise why! Thanks, Frank. I love it! Looking forward to following your journey online. Thanks for the update. We all miss Debbie and Frank but sure love living vicariously thru them. They are wonderful folks and you are lucky to have met them on this adventure.